The dryer is designed to rapidly dry slides by blowing warm air over the surface of the slides. The slide dryer accommodates two slide racks directly from a stainer and allows the slides to be stained in approximately 20-30 minutes. Power: 110 VAC, 60 Hz, 2 Amps. These Slide Warmers are designed for cytology, histology, pathology, and other biological applications in industrial and clinical lab environments. Ideal for use in the fields of cytology, histology, pathology, and biology for parffin tissue section mounting. 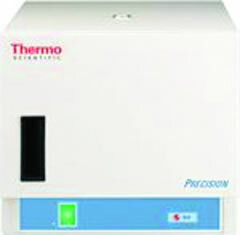 Thermal heater ensures even heat transfer. Anodized black surface provides contrast. LED temperature display. Size 25" x 8"
These slide warmers are ideal for use in cytology, histology, pathology and biology for paraffin tissue section mounting. Available in two sizes. With precision temperature control and a PTFE coating on the surface for easy cleaning this rugged portable warmer is perfect for many applications. 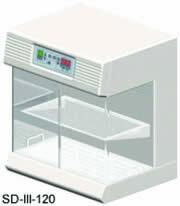 Its design allows for slides, coverslips and glassware to keep them at the optimum temperature for motility testing. The aluminum heating surface measures 7" and 11". 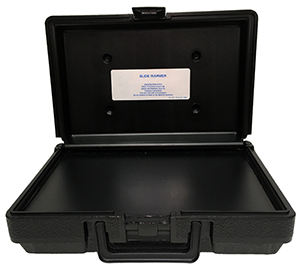 The unit features a simple solid state temperature control that is calibrated at 37°C (98°F) and it is housed in a durable plastic case with a great carrying handle. 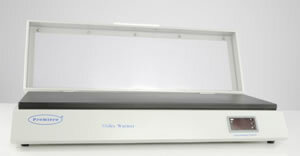 The hinged lid may be closed when not in use and the power cord is detachable and it stores in the box. 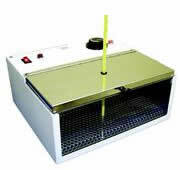 The Slide Warmer comes in 115 volt and 220 volt. Our Step Up™ Slide Warmer's unique patent pending design helps you save space while still meeting a busy lab's needs.